Target audience: Nonprofits, cause organizations, foundations, NGOs, social enterprises, businesses, social marketers, anyone with a Facebook page. I’ve been recommending PostPlanner to many of my clients (and friends) for months now. If you don’t know what PostPlanner is, it’s a way to schedule, manage and measure updates on your Facebook Page (here’s a video tutorial). They recently added a feature that allows you to quickly see what time of day is best for you to update your page. Now Facebook Insights does allow you to download a CSV file and figure this out manually, but it takes a while to prepare the data for analysis (date posted and time posted live in the same cell – yuk). With PostPlanner, all you have to do is rank your updates by likes, comments and/or clicks to see what time of day seems to be most prevalent. Target audience: Facebook Page administrators, nonprofits, foundations, NGOs, cause organizations, Web publishers, educators, journalists, general public. What is a good onlilne tool to automate posting to Facebook? 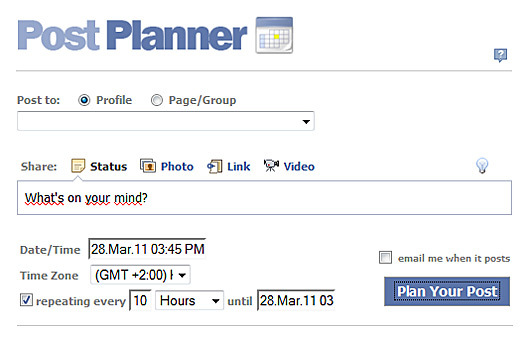 There are a few solutions out there, like HootSuite or Seesmic, but the best one I’ve come across is PostPlanner. Post photos and videos to your Facebook’s photo albums (wall) as if you posted directly to Facebook. Edit titles and excerpts of posted articles. White-label the app with your own icon and link it back to your website or Facebook Page. In this video above I discuss why HootSuite and Seesmic may not be the best options for posting to your Facebook Page — by the way, I love these tools for Twitter! — compared to PostPlanner. Note that PostPlanner is a paid service: Try it out for free for 30 days, then pricing starts at $4.95 per month.